Two of my favourite bars in Paris serve homemade ginger juice, both from unlabelled plastic bottles. Both are peppery enough to give you a kickstart, no alcohol needed. One is the Bar Ourcq, a bright blue cafe by the Canal de l’Ourcq that lends out deckchairs and pétanque sets in the summer months. They have board-games inside too (including Trivial Pour-Sweet as a French friend of mine insists on calling it). On the countertop around 7pm, they lay out a saucisson, bread, olives and crisps for the apéritif. The other day when it was too cold to sit on a bench at sunset as I planned, I was grateful to find exactly enough change in my pockets (three centimes to spare!) to pay for a ginger juice and a spot in the corner amid the hubbub of regulars. And despite the ice-cube, it warmed me right up. The other bar serves an even stronger version, at the quirky Comptoir Général. It styles itself as a “ghetto-museum of Françafrique” (the history and culture of French Africa) and is filled with artwork, taxidermied animals, political posters, trees, and a vintage shop upstairs. The food is fantastic, served up as if from a street stall, and the cocktails potent. For non-drinkers, they have maracuja and bissap juice (passion-fruit and hibiscus, respectively) and the house ginger juice. I asked how it was made, and the girl behind the bar said just grated ginger and sugar. 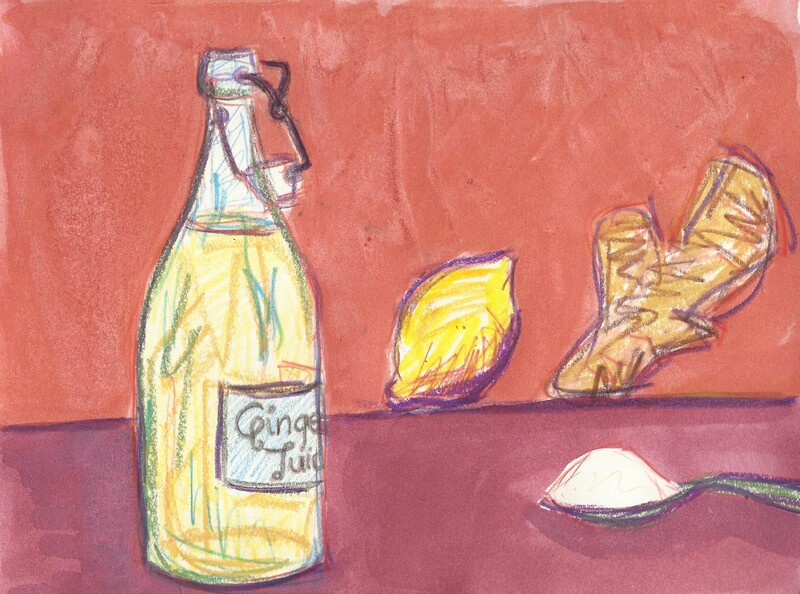 I love the fire of ginger and often eat the crystallised version by the handful. But it isn’t that common in France, even their pain d’épices, a sweet spiced loaf we would call gingerbread doesn’t traditionally have ginger in it. Neat, the juice works almost as well as coffee in the morning. Fiery and lightly sweet. Over lots of ice, it makes for an excellent pre-dinner drink when you don’t feel like alcohol. With pineapple juice and slices of orange it would make for a beautiful punch, rum optional. Peel and chop the ginger into rough chunks. Cut both ends off the lemon and slice off the peel so that none of the white pith is left. Blend ginger and lemon in a food processor to a pulp. Add a little of the water if necessary. (Or grate the ginger by hand and juice the lemon – more time-consuming.) Mix the ginger, lemon and water in a large bowl. Cover and leave for a few hours or overnight. Strain through a fine mesh sieve, pushing with the back of a spoon to extract all the juice then stir in the icing sugar until it dissolves. Freeze the leftover pulp, which will still have some flavour, for use in soups and curries. Pour into a bottle and keep in the fridge for a week or so. Serve over ice with a splash of water if the ginger taste is too strong. Mix with half pineapple juice for a refreshing summer drink. Add a splash to herbal tea or honey and lemon when it’s cold; or, of course, use in cocktails and fruit punch. I love ginger and will make this soon. I was suppose to be in Paris this week but my mother got very ill and no I’m in Germany instead. Paris will have to wait. I got all the ingredients in my fridge! I have read an article about ginger syrup which can be added to your favorite drinks as well but the process includes a lot more sugar and an our of cooking. I like how simple this process is. I think this is more doable for me.